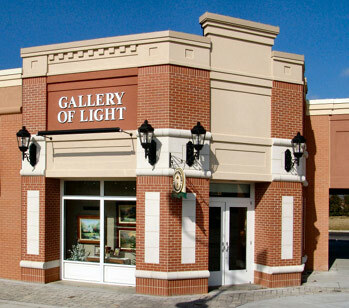 Located in one of Pigeon Forge's premier shopping venues, our Gallery of Light is one of our sparkling gems. Its proximity to family themed attractions and fantastic dining establishments makes it the perfect place to shop for Thomas Kinkade when you bring the family to vacation in the Smoky Mountains. Wide isles and generously spaced viewing rooms are one of the many features that can be found at the Gallery of Light. From Atlanta, GA: Go through Cherokee, N.C., take 441 North through the mountains to downtown Gatlinburg. Stay on 441 N through Gatlinburg onto the Spur towards Pigeon Forge. We are located on the left just past traffic light at Wears Valley Road. The Helicopter Museum will be on the right accross from Walden's Landing. Plenty of free parking. 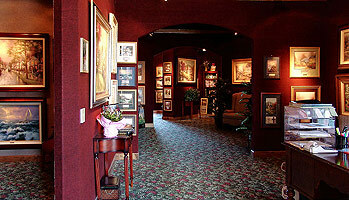 The Gallery is conveniently located just down from Atlanta Bread Company. From Townsend, TN: Take Wears Valley Road toward Pigeon Forge, come to Pigeon Forge, turn left onto 441 N towards Knoxville. We are located on the left just a few hundred feet down 441 N. The Helicopter Museum will be on the right accross from Walden's Landing. Plenty of free parking. The Gallery is conveniently located just down from Atlanta Bread Company. From Johnson City, TN: Take 321 South straight to downtown Gatlinburg, turn right at traffic light #6 towards Pigeon Forge. We are located on the left just past traffic light at Wears Valley Road. The Helicopter Museum will be on the right accross from Walden's Landing. Plenty of free parking. The Gallery is conveniently located just down from Atlanta Bread Company. From Interstate 40 West: Take Dollywood/Pigeon Forge exit - turn south (Route 66), turns into #441 south, stay on this through Sevierville, into Pigeon Forge. We are located on the right just past The Helicopter Museum that will be on the left accross from Walden's Landing. Plenty of free parking. The Gallery is conveniently located just down from Atlanta Bread Company. From Asheville, NC: Take I-40 west about one hour, then exit onto Foothills Parkway, left onto 321, towards downtown Gatlinburg, turn right at traffic light #6 towards Pigeon Forge. We are located on the left just past traffic light at Wears Valley Road. The Helicopter Museum will be on the right accross from Walden's Landing. Plenty of free parking. The Gallery is conveniently located just down from Atlanta Bread Company.